Remember Microsoft FrontPage? It was discontinued in 2006, but its WYSIWYG spirit lives on in products such as XSite Pro. With XSite Pro ($197), you can create an entire website without writing a single line of code. Then again, there are much cheaper ways to create your own website without coding, such as Artisteer ($130) and Weebly (free). So, is XSite Pro worth the price? Well, it depends. Aimed at Internet marketers, XSite Pro contains several sales letter templates. Visually, your websites will not break any new ground: Websites created using XSite Pro look like they were based off a template, which is indeed the case. The application ships with no templates, but an optional installer packs dozens of designs you can freely use. Each template is different, but they all feel similarly generic. Some templates do have an angle, like a header image featuring two smiling businesspeople -- but even these stock photos don't add much in the way of personality. No matter which template you choose, you will probably want to swap out these with images of your own. But having a beautiful website is not the point here, really. XSite Pro is all about effective websites that generate revenue for their owners using affiliate product sales and banner ads. The application makes it easy to create many (somewhat) different websites in a short amount of time, each with its own marketing copy and banner ads, and each targeting a different niche. You don't begin working by creating a website, but by creating a project which can contain numerous websites. 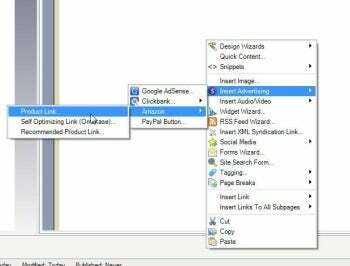 The context menu lets you easily insert affiliate links into your website. XSite Pro makes it very easy to add affiliate links to Amazon and ClickBank: The commands for adding them are built into the right-click menu of the visual editor. When you tell XSite Pro you want to add a Clickbank link, it opens up a dedicated Product Search dialog in which you can write the keyword you are targeting ("fitness"), and instantly get back a list of ClickBank products you may be able to make a commission on. Each product is shown with a title, description, and a category, as well as sales metrics showing how well it is doing. XSite Pro also lets you evaluate how effectively each page is written: The Page Analysis tab shows a word frequency table (so you can make sure you're targeting your keywords properly), as well as a list of Suggested Actions such as "You should have the main keyword appear at least once in the links on your page." 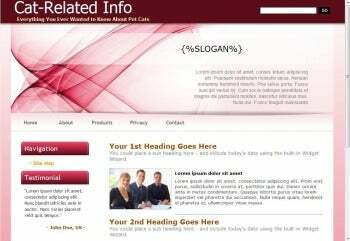 Sites created using XSite Pro feel like they were generated using a template. When you're done creating your website, you can publish it right out of XSite Pro. The application feels friendly, and the interface is bursting with buttons and text, but is sensibly laid out. If you need to make revisions later, that's easily done. XSite Pro itself is aggressively marketed: After you download the application, you get no less than 12 overly friendly follow-up emails, some of which try to upsell you on related services. So to answer my own question: If you are a non-technical user and you feel that affiliate marketing is a good way to make money online, XSite Pro will make it possible for you to test your marketing prowess with a minimum amount of technical fiddling. Your websites will not win any design awards, but they might convert users into paying customers and net you affiliate fees. Note: The Download button takes you to the vendor's page, where you can download the most recent version of this buy-only software. 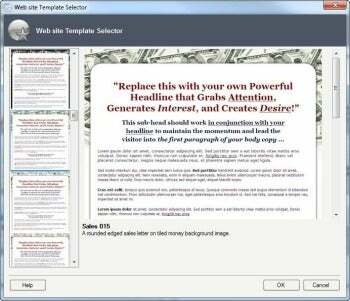 XSite Pro is a WYSIWYG website creation tool with features for affiliate marketers.